Jesus has called you. Called you to be different. Called you to love. Called you to restore. Equip your small group to answer the call of God on their life with this incredible 12-session DVD. 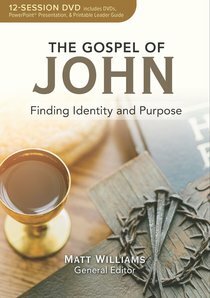 The Gospel of John: Finding Identity and Purpose DVD Bible Study covers 12 passages from the book of John that will deepen your understanding of identity, calling, and God's purpose for you. Packed with leader tips, discussion questions, practical applications, and prayer points, this DVD study can be led by anyone! Sessions are taught by 6 professors with specialized areas of knowledge. Have you ever wondered what you were meant to do? What your purpose is? How can you answer God's call on your life? Deepen your understanding of what it means to be called by God with the events, miracles, and practical applications in the Gospel of John. Designed to accompany the DVD study, The Gospel of John Participant Guide provides an outline of the video teaching with room for notes and includes photos, maps, additional information, and a five-day personal Bible study guide after each lesson. Additional participant guides may be purchased. ISBN 9781628627862. Hear truth from those who spend their life investigating the meaning of the Bible and are excited to bring the fruits of their knowledge and life experience to you. The first part of each lesson delves into the meaning of the biblical text, using first-century historical background to bring out the text's deeper meaning, which involves investigating the historical, religious, and social background of first-century Jewish culture and their Greek and Roman neighbors. In the second part of each lesson, after making deeper connections to the biblical texts, instructors will help you and those you lead to apply the relevant lessons to your life in practical and rich ways. Life application in the church today is often shallow and many times unrelated to the real meaning of the biblical passage. In this series, the practical application derives directly from the biblical text. About "The Gospel of John: Finding Identity and Purpose (Dvd, 12 Sessions)"